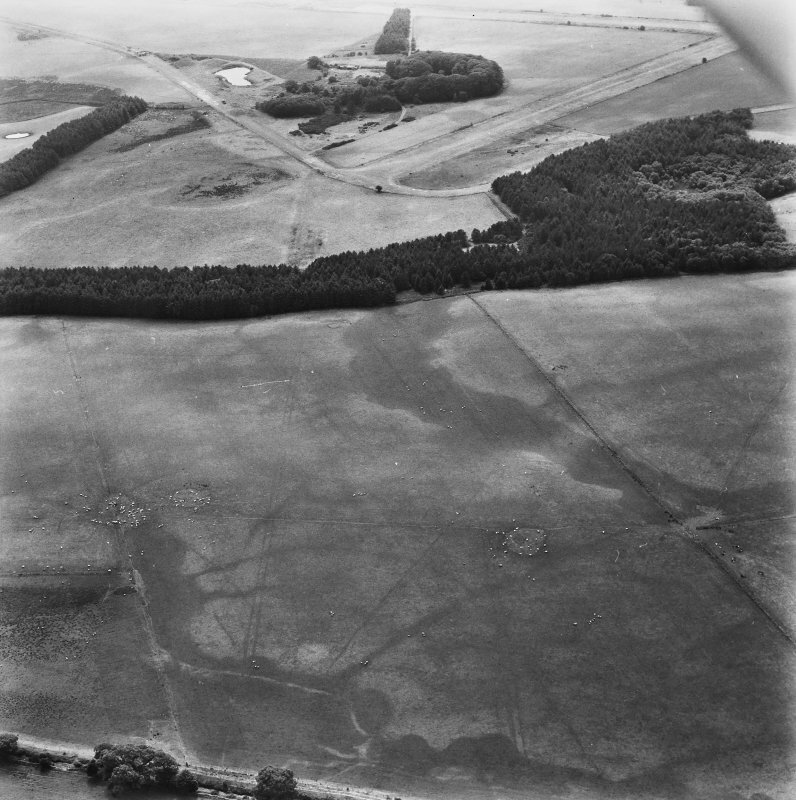 Oblique aerial view of the cropmarks of the ring ditch and the field boundaries at Castle Kennedy airfield, taken from the NNE. 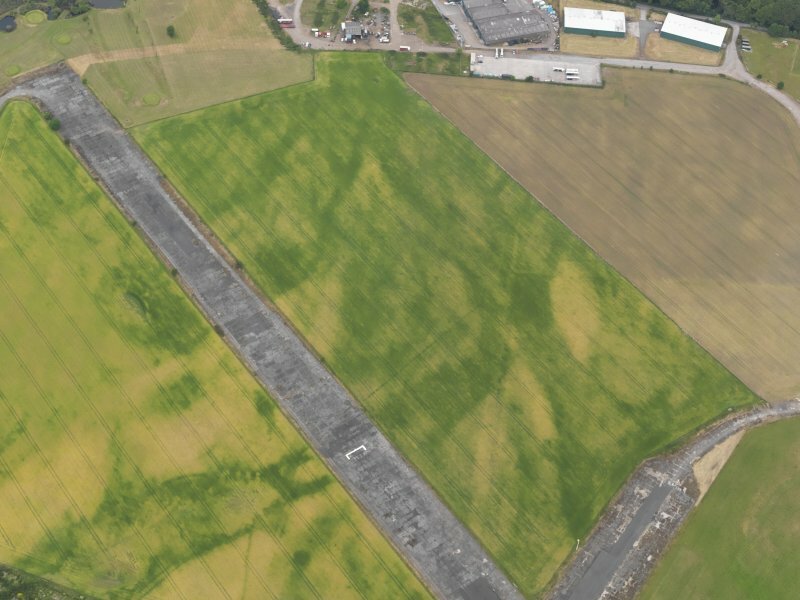 Oblique aerial view of the cropmarks of the ring ditch and the field boundaries at Castle Kennedy airfield, taken from the ESE. The airfield opened in 1941 and like Low Eldrig airfield it had problems with waterlogged runways. 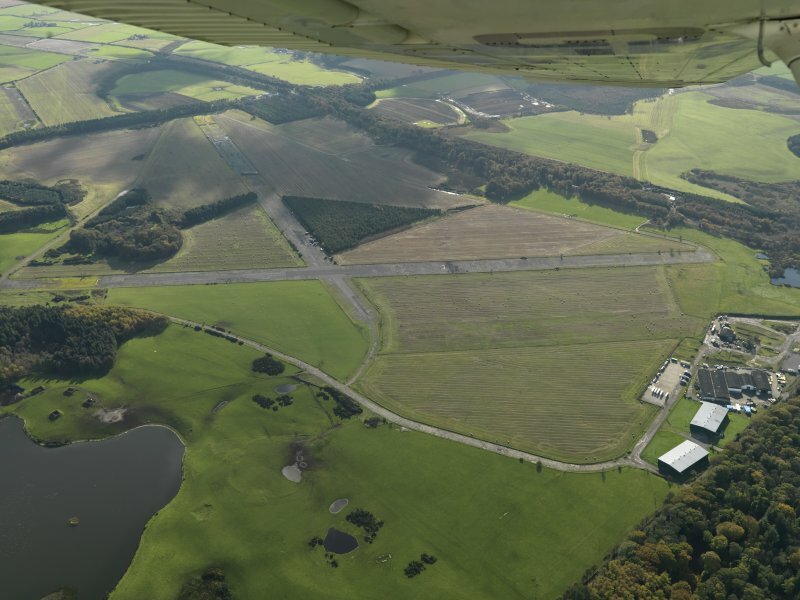 To solve this two concrete runways were built along with three hangars. It closed during 1945. It was re-activated in the period 1955-1957 for a car-ferry service to Ireland which failed and since that date only light aircraft have used the runways. Nearly all buildings have been removed except three hangars. 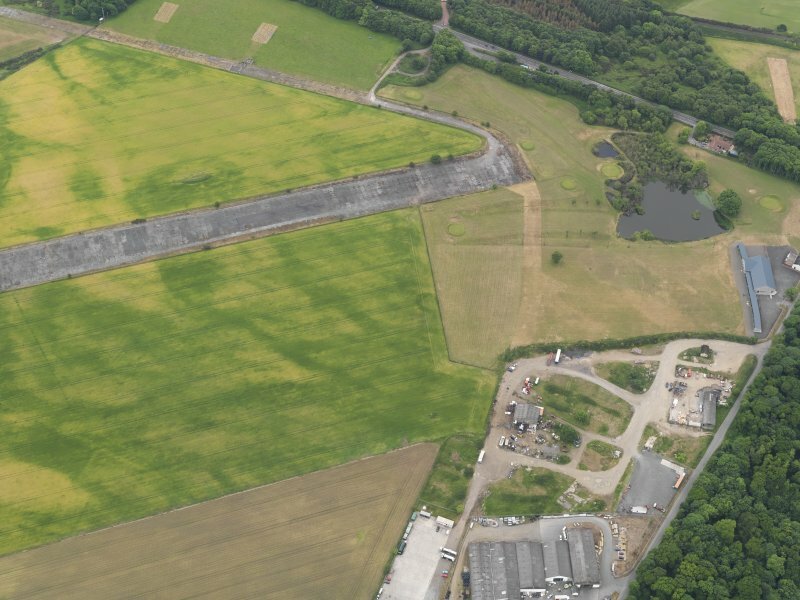 This airfield can trace its origins from a visit made to the site in 1913 by No.2 Squadron Royal Flying Corps (RFC) and mail flights to Ireland between the wars. The World War II station was opened in 1941 as an air gunnery school with four large and nine 'blister' hangars being built. 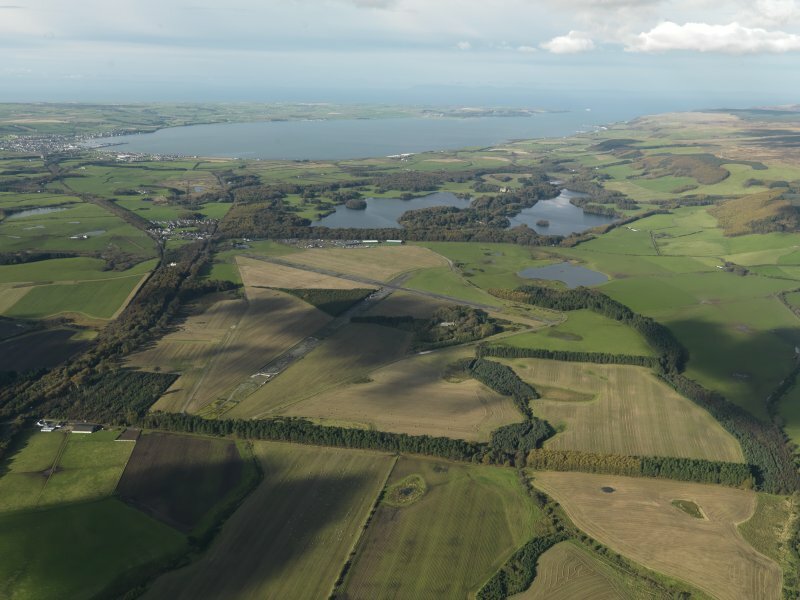 The air gunnery school moved to Anglesey being replaced by Coastal Command Torpedo Training Unit who were using part of the Firth of Clyde as a firing range. There was also an Army presence in the area, as it is known that Royal Engineers (REME) workshops were located in the former turret instructional building after the school moved. 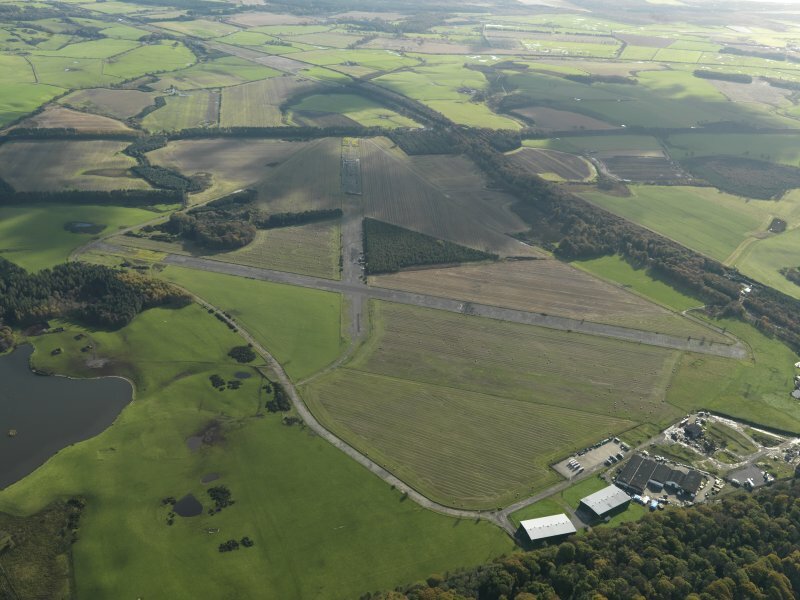 The airfield was used after the cessation of hostilities as a storage unti for surplus aircraft until closure during 1947. 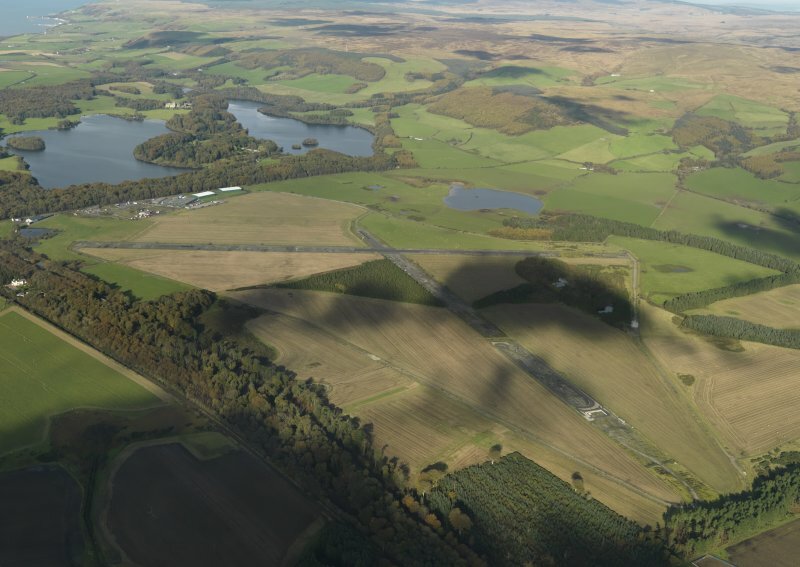 Two of the large hangars (NX16SW 111.00) and many of the site buildings can still be seen as part of the Castle Kennedy Industrial Estate which is spread through the edge of Lochinch Estate and a camp was built on the site now occupied by Castle Kennedy village and in the fields bewteen the village and Inch Church. A site visit in 2004 confirms Mr Bell's report. The airfield is visible on postwar RAF vertical air photographs, (106G/UK 987, 3146-3147, 4132-4133, flown 9 November 1945) and these images reveal extensive accommodation camps around the airfield as well as the disposition of the hangars, runways and perimeter areas including the bomb store at NX 1217 6024.